Once again I am making brownie's from scratch.... with the recipe from my Aunt Betty Crocker! The woman knows her way around the kitchen. Whom am I to question her magical ways. The last time I attempted to replace my empty can of Baker's Joy... there was none of the shelf. So I settled for PAM baking spray. Which works fine. I still prefer the Baker's Joy. Anywho... since I used my favorite round cake pans... I decided to take a couple quick pictures. 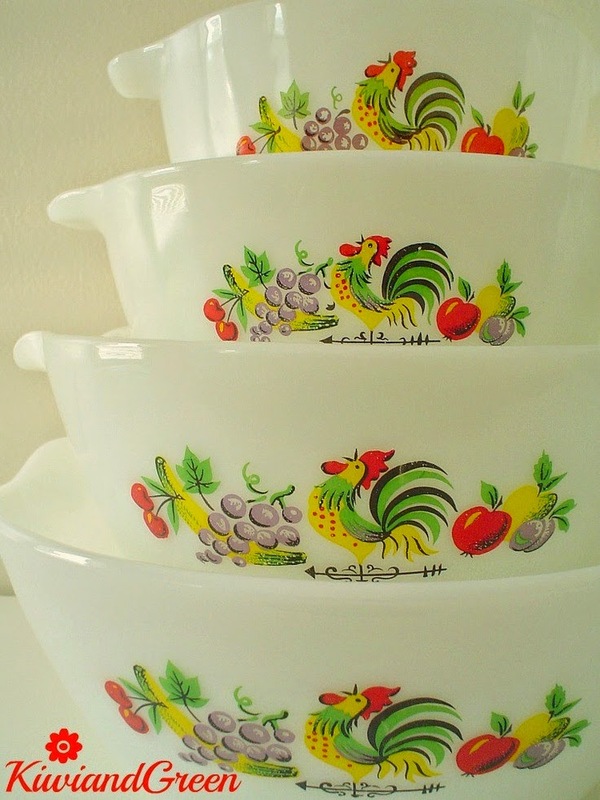 The yellow round pan is Pyrex... and that fabulous Rooster cake pan is from Fire King. I have a couple more pieces of this pattern. But what I have been on the look out is the set of mixing bowl. picture from here... and isn't it gorgeous! Full well knowing, that I have no business buying any more mixing bowls sets! 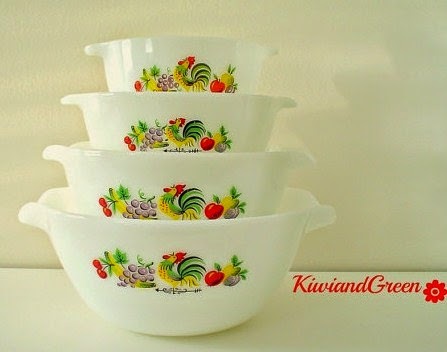 I keep looking for the two smaller Rooster bowls. Hello, I didnt read your entire post...I have a 5 piece chanticleer set, MINT, what exact small bowls are you looking for?